What Determines a Currency's Value? Here's a post that originally appeared in 2013 but is worth revisiting. In my recent post on the relative strength and weakness of various currencies, I didn't address one big question: what determines a currency's value? Is there, in fact, a “right answer” as to the value of each currency? As with many economic questions, there are several right answers, depending on how you look at it. Currency markets set values . . .
One way to consider the value of a currency relative to another is to look at the markets—how many yen will it take to buy a dollar? 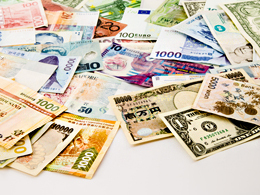 The foreign exchange, or forex, markets are among the largest in the world. When currencies are allowed to freely float, or trade at will, the markets will determine what a currency is worth. This is the most transparent and informative way to set values, as it reflects a wide, liquid market with many participants. Unfortunately, the market can deliver results that are inconvenient or damaging for governments, the issuers of the currencies. Governments can attempt to change the value of their currencies in various ways. The simplest way is to create more of the currency, which, by increasing the supply, will lower the price if demand remains constant. The Swiss government recently did this in response to the strengthening of the Swiss franc, which was making Swiss exports too expensive in terms of other currencies. The flip side is to restrict supply of the currency in an attempt to strengthen it. An example would be a country spending its foreign currency to buy up its domestic currency. This both increases demand for the domestic currency and reduces supply, and it can be effective in supporting the value of the domestic currency—until the government runs out of foreign currency. Then the market takes over again, often with a vengeance. Until recently, Venezuela was doing this, among other things, to support the value of its currency. Finally, countries can agree on an exchange rate that they will mutually support, either at a fixed rate or within a band. The reason for doing this is to minimize the uncertainties and costs for businesses or individuals trading among the countries. The euro, for example, was preceded by just such an agreement among the European countries, and the Chinese currency was formally pegged to the U.S. dollar from 1994 to 2005; even now, it appears to be managed closely by the Chinese government—much to the U.S. government’s displeasure. There are other ways to affect exchange rates that are less explicitly interventionist, most of which have other primary objectives. Higher interest rates, for example, make a currency relatively stronger, and strong growth in a country can also increase demand for a currency, making it relatively stronger. On the other hand, higher inflation rates make a currency relatively weaker. At the end of the day, exchange rates are a result of multiple factors, which makes it hard for a democratic government to manage them closely for long. We have seen this in the increasing economic imbalances in the eurozone, which may yet collapse. The peripheral countries have historically rebalanced their economies by devaluing their currencies. With the euro, they no longer have that option—and the process of rebalancing through reducing wages and consumption is politically much more painful. What can the "Big Mac index" tell us? Even as countries attempt to manage their currencies, they are implicitly doing so against what they perceive as a “fair,” or properly valued, exchange rate. One way of determining such a fair exchange rate is to compare currencies' ability to buy things. This is not a perfect mirror, since wages, regulations, and actual supplies of different materials vary from country to country, but it is a reasonable proxy. This method is known as “purchasing power parity,” from the idea that equivalent buying power should result in an equivalent cost in each currency. There have been many versions of this method, each of which attempts to account for the problems I mention above in a different way. My favorite is from The Economist, which presents the cost of a Big Mac hamburger from McDonald’s as the base asset and compares that across currencies and countries. Using the Big Mac index, you can see that the Swiss franc, for example, remains overvalued, as does the Venezuelan bolivar—although for opposite reasons. You can also see a very wide range in valuation. Over time, markets do tend to get currency values right, but they can also be way off. The Big Mac index, although certainly not perfect, provides one way to look at just how out of whack markets are at any given time. It can also provide some guidance as to where the U.S. dollar is and what that might mean for import costs—especially for oil—going forward.